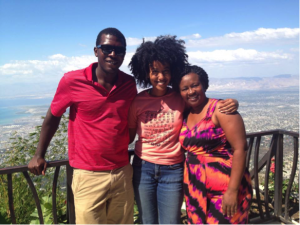 I did not know what to expect when I went to Haiti in March 2015 through Global Exchange. Like the majority of other developing nations, the primary U.S. news coverage in Haiti focused on the country’s poverty and devastation due to natural disasters. Haiti was on everyone’s radar in January 2010, the month of its devastating 7.0 earthquake. Multiple western nations, including the United States, pledged millions of dollars in aid toward Haiti. The media response was swift and hopeful, and dozens of high-profile celebrities took advantage of the limelight. Actors and politicians went to Haiti to build houses while camera crews followed them around. Nearly six years later, Haiti has virtually vanished from U.S. media. I would go so far as to wager a guess that the majority of Americans don’t know that Haiti is currently in the midst of a heated presidential election, which has been rescheduled several times. Haitians have been waiting with bated breath for this moment for years. The current president, Michel Martelly, has been in power since 2011. Haitians have been extremely dissatisfied with his tenure, and he has had several allegations of corruption against him. Even less likely to be known is that Haiti has been facing an ongoing cholera outbreak since approximately October 2010, considered one of the worst cholera outbreaks in recent history. Foreign aid workers mostly likely caused this outbreak. MINUSTAH, the acronym of the French translation for the United Nations Mission in Haiti, sent peacekeepers to Haiti in October 2010. The waste from their encampment was transferred to an open area where children and animals had access to it. Shortly after aid workers set up their camp, hospitals in the same region were faced with an increase in deaths from diarrhea and dehydration, symptoms frequently associated with cholera. The UN does not acknowledge responsibility for causing the cholera epidemic in Haiti. So where did that leave Haiti in March 2015? During my incredible stay there, I met some of the most passionate, driven, independent individuals I have ever known. The most incredible of whom was Madame Réa Dol, a Haitian mother and teacher in her early 50s. For most of her life, she’s facilitated community-driven partnerships with the goals of education reform, medical treatment and prevention programs, and microfinance initiatives. She introduced us to activists, parents, and teenagers who were all fiercely invested in the future of Haiti and were building support systems for themselves and their families through education, innovation, and technology. One example of innovation in Haiti is SOPUDEP (Society of Providence United for the Economic Development of Petion-Ville). SOPUDEP is a Haitian-founded and run grassroots organization located in Port-au-Prince. The organization’s Founder and Director is Réa. SOPUDEP’s focus is on providing accessible education to adults and children, supporting children’s and women’s rights, and creating programs of economic empowerment for members of their community. SOPUDEP also works closely with other local organizations to help them achieve these same goals in other communities that face economic and social challenges. Another example of innovation in education is MOJUB, a literacy circle and community development organization established and run by women in an impoverished neighborhood of the city. MOJUB runs a school for the community, an Internet center (established through international support), and a microcredit program to help women launch income-generating activities. During my 10-day trip in Port-au-Prince, the gorgeous and bustling capital of Haiti, I was lucky enough to travel with Réa and stay in her home with her family and 25 other American tourists. She built a hostel attachment to her home that travelers can rent out. In addition to her family, her staff and their children also live on her compound. 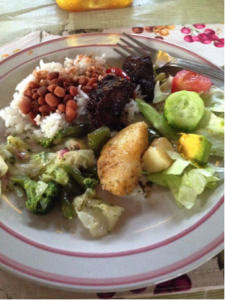 Delicious beef, rice, beans, vegetables, and salad with amazing local avocados. 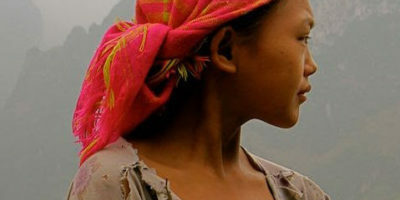 I had the heady and breathtaking experience of bearing witness to Réa’s daily life. Her cell phone rang every ten minutes. It seemed as though everyone in Port-au-Prince knew Réa. From finding foster-care placements to helping students at her school afford uniforms, Réa knew everything there was to know. After dinner at Réa’s home, I would hang out with Réa’s son, a budding business guru, the daughter of one of Réa’s drivers, a sweet nursing student solidly focused on her future, and Réa’s adopted 9-year old son, who was fluent in Haitian Creole and Spanish and could easily understand conversational French and English. This little boy was an exacting language teacher, and I credit him for teaching me proper pronunciation when speaking Haitian Creole. 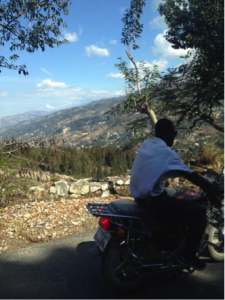 As an American in Haiti, I felt incredibly aware and self-conscious of my ignorance. I speak conversational French and mistakenly assumed that I would be well equipped to communicate with those around me. 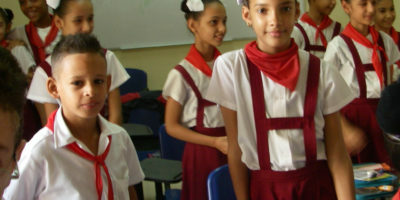 While French is technically one of the official languages of Haiti, roughly 40% of the population speaks the language. 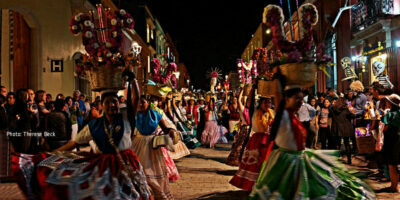 The official language of Creole is primarily spoken in Haiti and is an essential component of wide communication. Haitian Creole is a mix of French, Spanish, Portugese, Taíno, and West African languages, and I had so much fun learning it. Going around with my little journal and scribbling down phrases, I found it was easy to ask those around me for help learning. That was just the beginning. I have so much more to learn and can’t wait to go back. I have so many friends I can’t wait to visit! 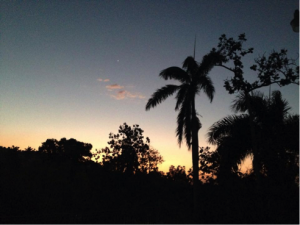 Click here to learn more about upcoming trips to Haiti with Global Exchange!